News in from Carina: they’re running a site-wide 40% off sale in honor of RWA! 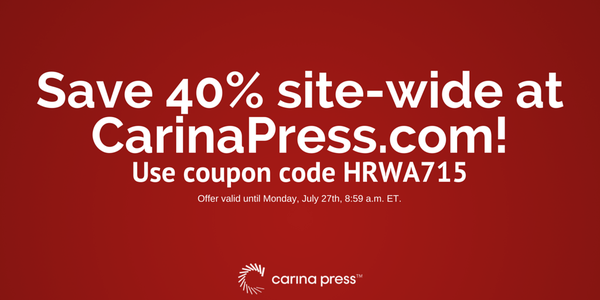 If you go to CarinaPress.com any time between now and 7/27, you can use the coupon code HRWA715 to get 40 percent off your purchases! Specifically, as per the photo, 7/27 at 8:59am Eastern Time! Note that this sale does apply only to purchases on CarinaPress.com itself, although of course you can still buy the books on all the other major ebook providers. So if you haven’t gotten any of the Rebels of Adalonia books yet, now is a VERY good time! Here are the direct links to the Rebels books on the Carina site, and don’t forget, if you want to read this trilogy, you need to read them in this order! And of course, the sale is for ALL Carina titles, not just mine! So this is a great chance to get some of the Carina titles I’ve featured on the Boosting the Signal posts, too! Call for topics for visiting Carina author!